After Jenn Smith’s flyer “God Made Corn” blew off of Western Pole, a traffic light near Western and Augusta hosting eight-and-a-half-by-eleven-inch artworks curated by Jesse Malmed (formerly of Trunk Show), she posted on Facebook: “Friends, don’t visit Western Pole this week to see my work—the strong Chicago wind has blown it away.” Fittingly, Smith’s work explores the ambiguities of religious belief and representation, so what better way to allude to the intangible than to unexpectedly lose work to the greater powers of the weather? Smith conveys a similarly suggestive cheekiness in her paintings. Drawing from her upbringing as an Evangelical Christian in the rural Midwest, she portrays the mysteries of spirituality, its everyday influence, and how such ideas might make us feel. 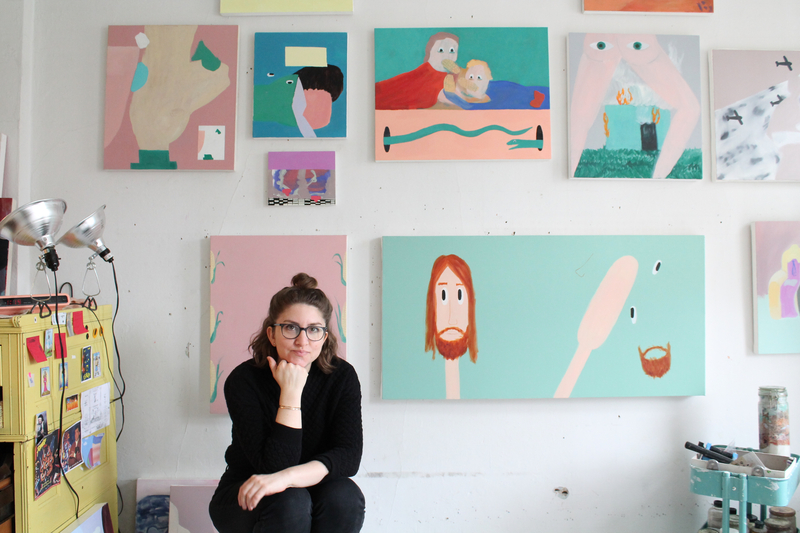 Smith mingles soft, plushy, abstract shapes; pastel pinks, purples and turquoises; and figurative Christian iconography playfully yet thoughtfully on her canvases. Although she does not paint in a realist style, the figurative and inquisitive frankness of her works provoke a chuckle. For instance, in “Untitled (cars),” a man likely meant to be Jesus but who also resembles a hipster, sits in a grey car facing the side with one hand on the wheel and the other resting lazily out the window. A second version of the same scene occupies the bottom half of the canvas in reverse. In both, the man looks toward the viewer ambiguously, confusing who is navigating: him or us. Smith’s distinct candy-colored, matte palette alludes to innocence and childhood. “In the dollar store at that time in the rural Midwest, everything was a corn blue and everything was paired with a mauve, and they blew my mind.” The light colors entice viewers as they contrast the complex narratives she invokes.